Definition at line 44 of file llmodaldialog.h. Definition at line 46 of file llmodaldialog.cpp. References centerOnScreen(), FALSE, LLPanel::setBackgroundOpaque(), LLPanel::setBackgroundVisible(), setVisible(), and TRUE. Definition at line 64 of file llmodaldialog.cpp. References LLFocusMgr::childHasKeyboardFocus(), gFocusMgr, and LLFocusMgr::unlockFocus(). Definition at line 71 of file llmodaldialog.h. Referenced by LLViewerWindow::handlePerFrameHover(), and idle_shutdown(). Definition at line 266 of file llmodaldialog.cpp. References LLRectBase< Type >::getHeight(), LLRectBase< Type >::getWidth(), LLUI::getWindowSize(), llround(), LLRectBase< Type >::mBottom, LLRectBase< Type >::mLeft, LLView::mRect, LLVector2::mV, S32, LLView::translate(), VX, and VY. Referenced by LLModalDialog(), reshape(), and LLAlertDialog::setVisible(). Reimplemented in LLAlertDialog, LLMakeOutfitDialog, and LLFloaterTOS. Definition at line 233 of file llmodaldialog.cpp. References LLFocusMgr::childHasKeyboardFocus(), LLFocusMgr::childHasMouseCapture(), LLFloater::draw(), LLControlGroup::getColor(), LLRectBase< Type >::getHeight(), LLControlGroup::getS32(), LLFocusMgr::getTopCtrl(), LLView::getVisible(), LLRectBase< Type >::getWidth(), gFocusMgr, gl_drop_shadow(), mModal, LLView::mRect, S32, LLUI::sColorsGroup, LLUI::sConfigGroup, LLFloater::setFocus(), LLFocusMgr::setMouseCapture(), LLFocusMgr::setTopCtrl(), and TRUE. 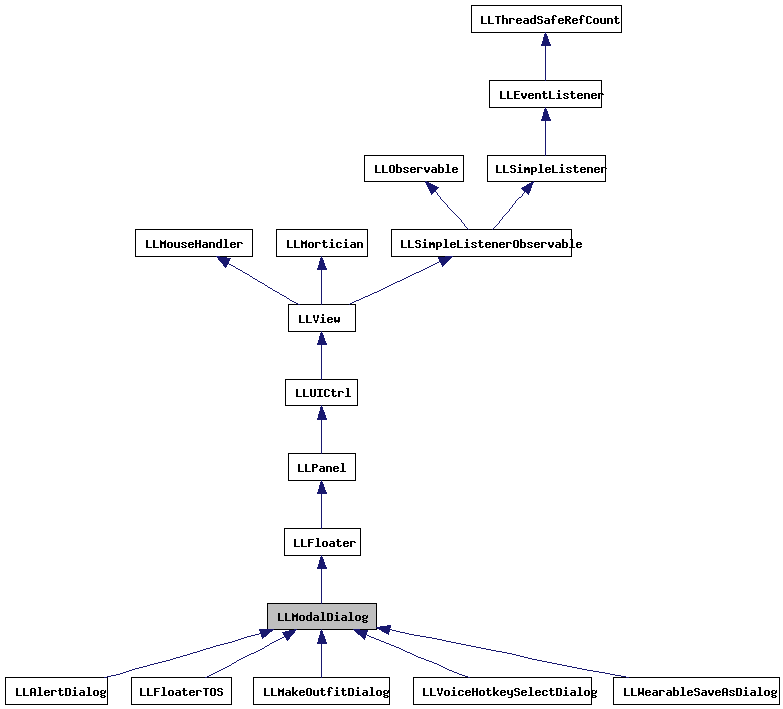 Referenced by LLFloaterTOS::draw(), LLMakeOutfitDialog::draw(), and LLAlertDialog::draw(). Definition at line 183 of file llmodaldialog.cpp. References LLFloater::handleDoubleClick(), make_ui_sound(), and TRUE. Definition at line 161 of file llmodaldialog.cpp. References LLView::childrenHandleHover(), LLView::getName(), LLView::getWindow(), lldebugst, llendl, NULL, LLWindow::setCursor(), TRUE, and UI_CURSOR_ARROW. Definition at line 200 of file llmodaldialog.cpp. References LLView::childrenHandleKey(), LLFloater::close(), FALSE, LLFrameTimer::getElapsedTimeF32(), LLPanel::handleKeyHere(), KEY_ESCAPE, MASK_CONTROL, mModal, mVisibleTime, and TRUE. Definition at line 148 of file llmodaldialog.cpp. References LLFloater::handleMouseDown(), make_ui_sound(), mModal, and TRUE. Definition at line 171 of file llmodaldialog.cpp. Definition at line 193 of file llmodaldialog.cpp. Definition at line 177 of file llmodaldialog.cpp. Definition at line 296 of file llmodaldialog.cpp. References gFocusMgr, LLFocusMgr::setMouseCapture(), LLFocusMgr::setTopCtrl(), sModalStack, and TRUE. Definition at line 278 of file llmodaldialog.cpp. References LLFocusMgr::childHasKeyboardFocus(), LLFocusMgr::childHasMouseCapture(), gFocusMgr, NULL, LLFocusMgr::setKeyboardFocus(), LLFocusMgr::setMouseCapture(), and sModalStack. Definition at line 226 of file llmodaldialog.cpp. Definition at line 73 of file llmodaldialog.cpp. Referenced by LLAlertDialog::createDialog(), and LLAlertDialog::setCheckBox(). Definition at line 126 of file llmodaldialog.cpp. References gFocusMgr, mModal, LLFocusMgr::releaseFocusIfNeeded(), LLFloater::setFocus(), LLFocusMgr::setMouseCapture(), LLFocusMgr::setTopCtrl(), LLFloater::setVisible(), and TRUE. 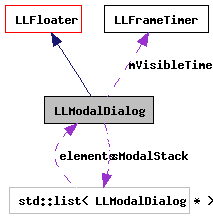 Referenced by LLModalDialog(), LLAlertDialog::setVisible(), and startModal(). Definition at line 79 of file llmodaldialog.cpp. References FALSE, gFocusMgr, mModal, LLFloater::setFocus(), LLFocusMgr::setMouseCapture(), LLFocusMgr::setTopCtrl(), setVisible(), sModalStack, and TRUE. Referenced by LLPanelLogin::handleKeyHere(), idle_startup(), LLFloaterCustomize::onBtnMakeOutfit(), LLPrefsVoiceLogic::onClickSetKey(), LLAlertDialog::show(), and LLWearableSaveAsDialog::startModal(). Definition at line 101 of file llmodaldialog.cpp. References gFocusMgr, llendl, llwarns, mModal, LLFocusMgr::releaseFocusIfNeeded(), sModalStack, TRUE, and LLFocusMgr::unlockFocus(). Definition at line 78 of file llmodaldialog.h. Referenced by draw(), handleKeyHere(), handleMouseDown(), setVisible(), LLAlertDialog::show(), startModal(), and stopModal(). Definition at line 77 of file llmodaldialog.h. Definition at line 80 of file llmodaldialog.h. Referenced by activeCount(), onAppFocusGained(), onAppFocusLost(), startModal(), and stopModal().